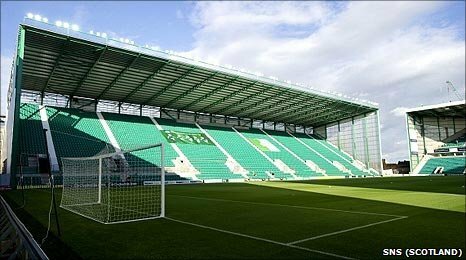 Hibernian have announced a profit of £100,000 for 2009/10; their sixth surplus in as many years. Chairman Rod Petrie described the profit as "a truly outstanding achievement within football, let alone football within Scotland". But the club had a drop in turnover, down 8% to £7.1m, due to reduced season ticket prices, the closure of the East Terrace and the harsh economic climate. Staff costs increased marginally, while the net debt stands at £4.1m. In a club statement, Petrie said the club is "self-sufficient and in control of its own destiny, the envy of many other clubs". The Scottish Premier League club say they are working towards reducing the wages-to-turnover ratio to a more sustainable figure of below 60%, from its current level of 68%. Hibernian lost the opportunity to increase turnover in 2009/10 when they were knocked out of the Co-operative Insurance Cup at the first hurdle by St Johnstone, then lost to Ross County in the quarter-finals of the Scottish Cup. While the closure of the old stand caused a dip in revenue, they are looking to the new East Stand that replaced it to help to generate income. Chief executive Scott Lindsay said: "The completion of the stadium provides the scope for additional revenue from home matches as well as allowing Easter Road to be utilised for other matches; such as cup semi-finals and Scotland U-21 internationals. "Our commitment to the manager and the team, and our ambition to compete at the very top of Scottish football is unwavering. "Ultimately our focus remains on sporting performance, the single most important factor in generating revenue."